As was established in the previous post, gloss is determined by the amount of light rays being reflected under specular reflection as opposed to diffuse reflection. The more rays reflected through the former method, the glossier the surface is. 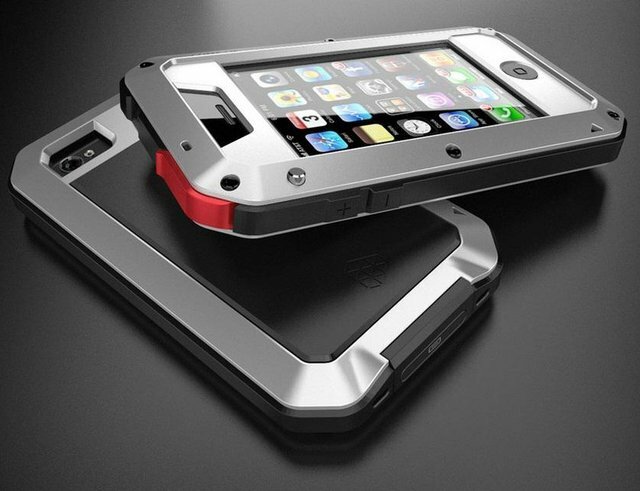 Taktik iPhone case designed by Minimal studio. The surface is described as glossy and although this image is (I suspect) a rendered image, the glossiness of the surface is still conveyed. For quality control, determining the item as meeting the expected gloss level is not acceptable through mere visual inspection (image taken from DesignBoom). Gloss could be compared qualitatively by comparing reflection of an image off different surfaces. Surface exhibiting sharper reflection will be considered glossier. But this is only useful in a qualitative way, and only if both surface reflections are distinctly different. Different observant will have different sight and recognition capability as well, so this method is physiologically affected. This qualitative method will not suffice as a quality control method. Gloss Unit (G.U. ): a scaling based on amount of reflected light off a highly polished black glass standard with a defined refractive index, and having a specular reflectance of 100 G.U. at a specified angle. 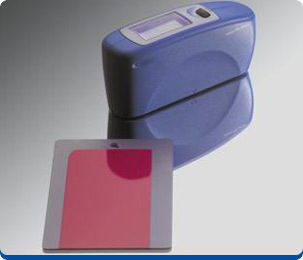 A glossmeter from BYK (image taken from BYK website). 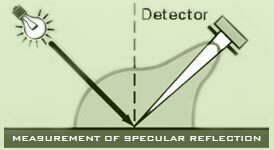 A glossmeter measures gloss by directing a beam of light at the surface in question at a specific angle, and measuring the amount of reflection. The angle used is dependent on the surface type - a highly glossy surface will use a smaller incident angle while a matte surface requires larger incident angle. While visual comparison uses the distinctness of the reflected image, gloss measurement uses the amount of reflected light, i.e. intensity of its reflection. And the standard black glass measurement of 100 G.U. is not the maximum obtainable G.U. - it is possible to obtain more than that. Working principle of a glossmeter (image taken from GlossMeters). The reasoning behind a higher G.U. than the black glass is due to refraction and reflection. The black glass standard is not a perfect example of specular reflection, so there are still rays of light reflected through diffuse reflection, while others are loss through refraction and absorption in the glass. Transparent materials, such as certain films, may give more than 100 G.U. due to the rays being reflected multiple times. Material and incident angle plays a role in determining the intensity of reflected light. G.U. of nonmetals such as coatings and plastics are angle dependent. The amount of light increases with the amount of incident angle. Rays of light not reflected through specular reflection will be lost as diffuse reflection and through absorption by the material. This is what happened on the black glass standard, hence 100 G.U. not being the maximum cap. Transparent materials with high refractive index have the ability to reflect the incident rays multiple times through its bulk and sending them to the sensor, thus giving a higher value than the black glass (more than 100 G.U.). 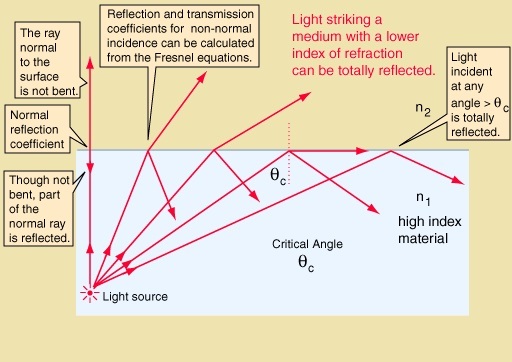 Certain incident rays which penetrate the surface and enter the material are reflected off the exit surface if it meets the criterion of total internal reflection. Less rays are lost through absorption as well since transparent material has less light absorbing particles compared to translucent material. Total Internal Reflection explained (image from HyperPhysics). G.U. of metals are less angle dependent. And being an opaque material with high reflective properties, more rays are reflected through specular reflection. Metal surfaces with a polished sheen and mirrorlike finishing could give a reading of 2000 G.U. Such measurements could be presented as % of reflected light instead, which gives a value normalized to a max of 100 (ideal case being 100% of light reflected). Gloss is determined by projecting a beam of light at a fixed intensity and angle onto a surface and measuring the amount of reflected light at an equal but opposite angle. There are a number of different geometries available for gloss measurement, each being dependent on the type of surface to be measured gloss meters.